We enjoy the great outdoors – unless some unruly creatures try to bring it indoors to our homes or offices. Pest Solutions 365 has specially trained wildlife pest control experts who can trap, remove or eradicate these pests from your home or yard. Bats benefit our environment by consuming large quantities of insects and pollinating crops and other plants. But they also carry rabies, which can be harmful or fatal to humans. Bats can flatten their bodies to 1/4 inch thick; if you can fit a quarter through an opening, a bat can squeeze through it, too. 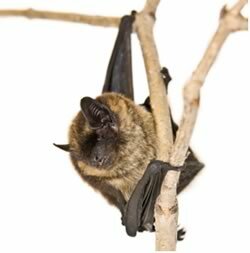 Bats are a protected species, so Pest Solutions 365 will not exterminate them. We will inspect for holes and seal them, placing exit doors in two or three of the openings. Bats will be able to leave through these exit doors, but won’t be able to re-enter your home. After two weeks, we’ll remove the exit doors and seal the holes. Please note: If you accidentally catch a bat or one gets trapped in your home, please contact the Nebraska Humane Society immediately. Don’t kill the bat or touch it. Moles and voles tunnel through yards while seeking insects for food. Their tunneling can destroy grass, trees and plants. 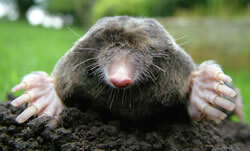 Pest Solutions 365 does not trap and remove moles and voles — we exterminate them. For voles, we make a direct application of poison directly into their holes. Moles are exterminated with synthetic poisoned worms or rolled oats mixed with zinc phosphate. Treatment is completed in three applications, 14 days apart. Raccoons, possums and woodchucks will eat almost anything. Raccoons and possums are usually nocturnal animals, while woodchucks are daytime animals. They usually enter homes near places where trash is kept. These pests carry a number of diseases, including rabies. Their feces can carry roundworm. 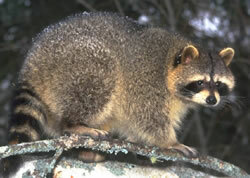 Pest Solutions 365 will place traps for raccoons, possums and woodchucks. We will leave the traps in your yard for five days and check them every morning, Monday through Friday. The trained, experience exterminators at Pest Solutions 365 can trap and manage many other varieties of wildlife pests. If these pests have infiltrated your home or yard, please call us for an evaluation. We will inspect the affected area and get customer feedback to determine which pest is present, then outline a treatment plan that works best for you and your family. Want to pay your bill online? Click here.